EA Sports used the real names of college players when coding its NCAA rosters internally and the NCAA's licensing authority argued that the publisher should be allowed to include them in the games themselves, according to emails turned up in a lawsuit against both the publisher and the NCAA, ESPN reported yesterday. It's a small detail compared to the overall revelations in ESPN's report, in which NCAA leaders privately debate the legitimacy of the "student-athlete" designation given to their amateur performers, and the member schools' right to publicize their likenesses and make money from it. But in sports video games they reveal a publisher pushing behind the scenes for something long assumed to be forbidden under the NCAA's self-determined amateurism guidelines—the use of real college players names. 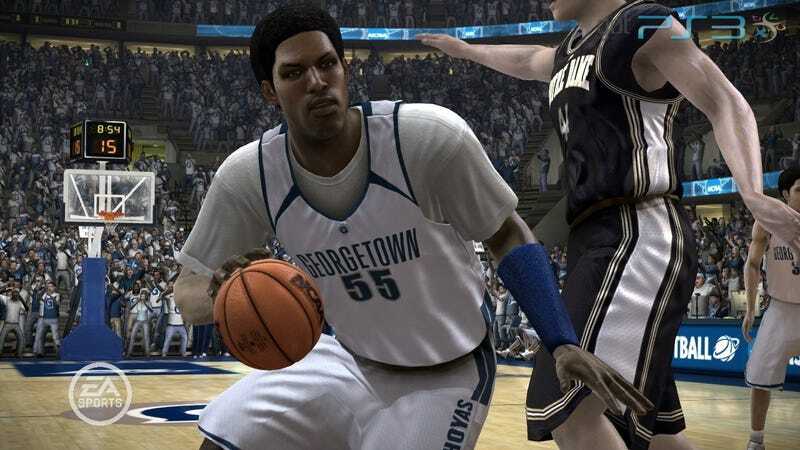 When it was discovered that EA Sports was developing its March Madness 2008 game with current players names—to "calculate the correct stats," for their teams—the Collegiate Licensing Company warned that "this is exactly the type of thing that could submarine the game if it got to the media." Yet later, says ESPN, the NCAA began to see its relationship with EA Sports as "an important tool to allow them to reach young people with the values associated with intercollegiate athletics," according to a CLC representative. A meeting, brokered by a senior NCAA official, soon followed. "The primary purpose of this meeting was to lobby for the rights to use rosters in video games, including the names of players on jerseys within the game. While it will still take some time (probably 12-18 months) to go through the NCAA legislative process, Greg [Shaheen, of the NCAA] is now confident that we will get this done. That will be a huge win for us and EA." The emails were brought to light under a lawsuit brought by Ed O'Bannon, a former basketball standout at UCLA who alleged his likeness, whether or not it had his actual name—appeared on UCLA's roster in NCAA-licensed video games that EA Sports published. Others have joined the suit. The NCAA forbids athletes at its member schools from being compensated for the notoriety of their athletic achievements, yet it does not prevent schools from marketing their actual likenesses or even selling replica apparel that obviously references them, through the use of their current athletic number. EA Sports, as a licensee of the CLC, is forbidden from using athletes' actual names per the terms of that agreement. Theoretically they could negotiate directly with an NCAA athlete for his or her permission to appear in a game, but receiving it, and putting them into the game—even without compensation—would terminate that athlete's eligibility to play at any NCAA school in that sport and jeopardize his or her team's standing under NCAA bylaws. As reported by ESPN, the CLC's email suggested that EA Sports' use of real players' names was for internal development purposes and would be removed later. March Madness and its successor series, NCAA Basketball was developed at EA Sports Canada before being closed after 2009. NCAA Football is developed at EA Tiburon in Florida. That EA Sports would use real-world rosters internally in developing its college rosters—whose participants are given fig-leaf names based on their uniform number and position—isn't so shocking. But ESPN's report implies that sharing rosters through the game itself was a response to the NCAA's rejection of EA Sports' request to use real names in its college video games. Roster sharing was enabled through the "EA Locker" feature beginning in NCAA Football 08 five years ago. It ended the old system of individual gamers mailing around memory cards, or downloading files and uploading them to cards through specialized equipment. It's the implication of Roster Share as a response to spurned efforts to get permission to use actual rosters that is intriguing. It basically suggests the growth and legitimacy of NCAA-licensed sports video games depend on how they reflect real world performers, and that a backchanneled means of user-distributed content could ultimately fulfill that even if the terms of the licensing agreement forbade it.